In a very mixed year overall for the WWE, their pay-per-view offerings at least provided some great moments for viewers of the WWE Network along with the fans in attendance, and WWE’s latest collection, “Best Pay-Per-View Matches 2018” brings together 17 of last year’s best big show bouts. As with prior collections in the series, matches from end of year PPVs such as Survivor Series and TLC aren’t included for timing reasons, but there is enough variety over the course of the three disc set to keep fans happy. Disc One kicks off in a huge way with the Men’s Royal Rumble Match from the 2018 edition of the Royal Rumble PPV. Although it sat in the middle of the card while the first ever female edition headlined the show, it was the best Royal Rumble match in many years, with Finn Balor anchoring the match as the Iron Man, some surprises from both the past and from NXT, and a dramatic finish between Roman Reigns and Shinsuke Nakamura. Another of WWE’s tentpole matches is next, as Reigns, John Cena, The Miz, Seth Rollins, Elias, Balor and Braun Strowman entered the Elimination Chamber to claim a shot at the WWE Universal Championship at WrestleMania 34. With an extra body involved, the match was more chaotic than usual, and had a key storyline in Cena being desperate to win the match in order to secure a big WrestleMania match. 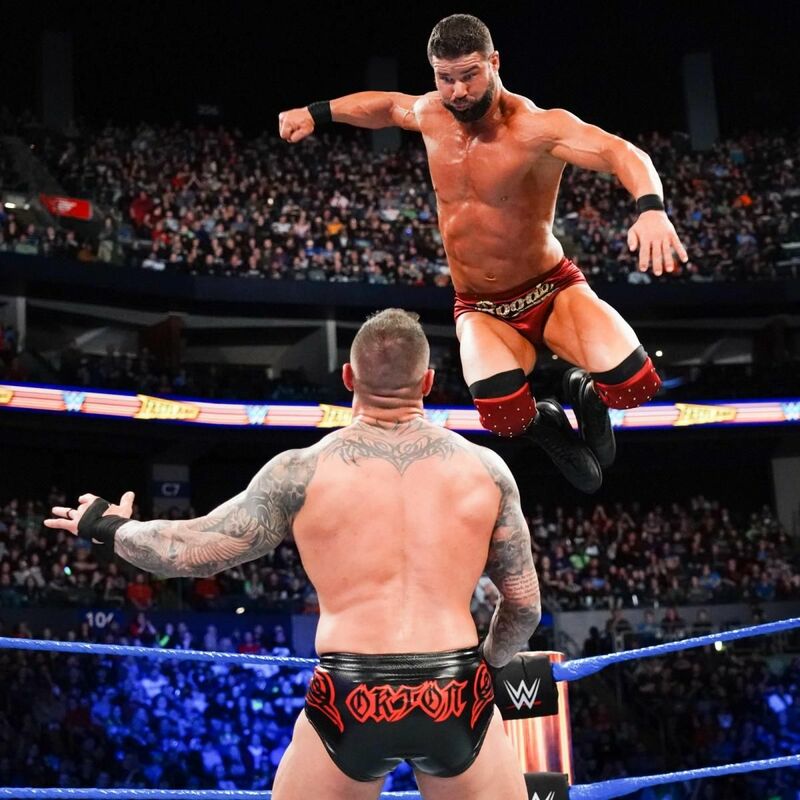 Fastlane 2018’s contribution is a polarising bout for the WWE United States Championship between champion Bobby Roode and Randy Orton, which is definitely slow-paced, but showed that Roode when on his game could fit the in-house WWE style, a match very much suited to Orton’s taste. The last bout on the disc is the main show opener from WrestleMania 34, as The Miz defended the WWE Intercontinental Championship in a Triple Threat Match against Finn Balor and Seth Rollins. The Kingslayer had gained momentum following a gauntlet match on RAW where he lasted over an hour, and this match showcased why Rollins ended up being the WWE’s male workhorse of 2018 – though Miz and Balor hold up their ends of the bargain as well in a very good match. Disc Two remains at the Showcase of the Immortals with the in-ring debut of “Rowdy” Ronda Rousey, as she teamed with Kurt Angle against Stephanie McMahon and Triple H. The former UFC Champion delivered beyond expectations in her first ever public wrestling match, judo throwing McMahon from hither to yon, and also outclassing The Game on a few occasions, while Angle threw back the years with his own great performance. One of the more underrated PPV matches of the year is next, as Seth Rollins defends the Intercontinental Championship against The Miz at Backlash 2018. The first non-Big 4 PPV where both RAW and SmackDown Live would host matches (due largely to the single brand PPVs not performing well on the WWE Network) saw Miz try and take the title over to his new home of SmackDown, with Rollins fighting tooth and nail to keep it on RAW, resulting in a great contest that ranks at the top of Miz’s long career. Both matches featured from Money in the Bank 2018 are from the women’s division, the first being the Women’s Money in the Bank Ladder Match, where RAW stars Sasha Banks, Ember Moon, Alexa Bliss and Natalya faced off with SmackDown’s Charlotte Flair, Becky Lynch, Naomi and Lana, producing a pretty violent match that showed the levels WWE’s female talent were prepared to take things going forward, and one which two of the competitors went on to replicate later in the year. The winner of the match also proved to be a key factor in Nia Jax’s RAW Women’s Championship defence against Ronda Rousey, where the Rowdy One stunned fans with how good her selling was for someone so inexperienced at the profession, making Jax look super intimidating. A strange inclusion in the set is Braun Strowman’s steel cage bout with Kevin Owens at Extreme Rules 2018, although it includes Owens taking an insane bump off the top of the cage through a table, the spot was rendered meaningless by the subsequent booking on TV. A better bout from the same show saw Roman Reigns and Bobby Lashley go one-on-one, a rare time where WWE booked the former ECW and Impact Championship effectively, although once again, the next night’s TV booking overruled it. 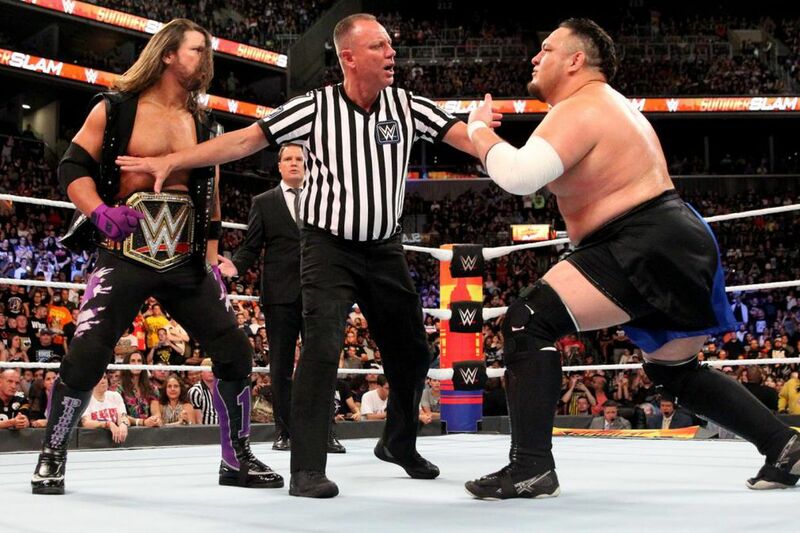 SummerSlam 2018 featured two old TNA rivals going at it over the WWE Championship, with AJ Styles defending against Samoa Joe. A slower-paced match than their past bouts, the drama of their storyline more than makes up for it, although the finish is a bit of a let-down. Disc Three remains at SummerSlam with the renewal of a decade-long rivalry between The Miz and the returning Daniel Bryan, as both men delivered on their hatred for each other, stemming from how Miz treated Bryan while Bryan was the general manager of SmackDown Live. The story sees Miz claim that he’s better than Bryan, only to be outwitted at nearly every turn, until a familiar saviour emerges. SummerSlam’s main event saw the conclusion of one of the most disappointing rivalries of 2018, but at least this bout between Brock Lesnar and Roman Reigns for the WWE Universal Championship didn’t outstay its welcome – in fact it’s a pretty action packed six minutes, although Braun Strowman’s presence with his Money in the Bank briefcase is very confusing. Hell in a Cell 2018 is represented by three matches, the first of which is Jeff Hardy’s very first match inside the demonic structure against Randy Orton. Although the Cell presented its obvious dangers, the most memorable spot sees Orton jam a screwdriver into Hardy’s pierced earlobe in one of the most squeamish spots in WWE history. 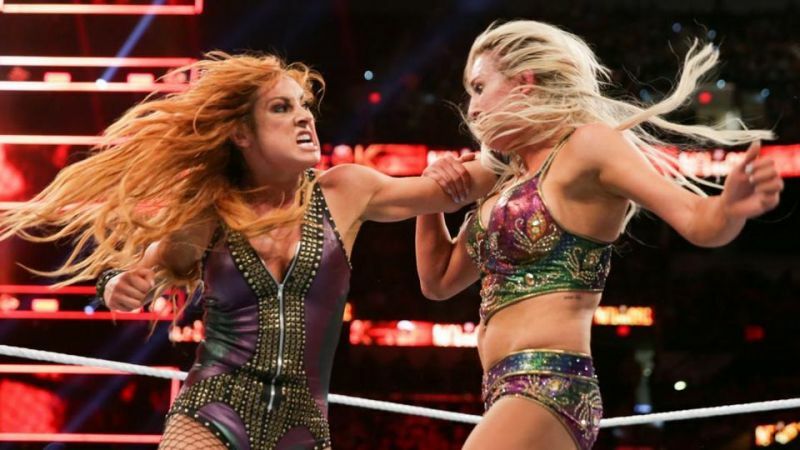 Following a heel turn at SummerSlam that instead helped make her the most popular Superstar in WWE, Becky Lynch got her one-on-one shot at Charlotte Flair for the SmackDown Women’s Championship, and shows why she’s such a problem for the Queen as the Lass Kicker had a counter to nearly everything thrown at her. The last bout is another Cell match, as Braun Strowman cashes in his Money in the Bank briefcase against new Universal Champion Roman Reigns. It’s a brutal bout with an ugly conclusion, but sadly one that proved to be Reigns’ last singles PPV match for the time being, as he would vacate the title in October following the reoccurrence of leukaemia. The final match of the set was the one voted on WWE.com as the best main roster match of 2018, as Becky Lynch and Charlotte Flair met once again in a Last Woman Standing Match for the SmackDown Women’s Championship at Evolution, the first ever WWE all-women’s PPV, this time with Lynch defending the title. The two rivals went all over the building, using many weapons, stealing the show on one of the most important nights in recent WWE history. This is also the match where Lynch moved on from being just the Lass Kicker, and ended up becoming The Man, and the person hotly tipped to have WrestleMania 35 built around her. 'Best Pay-Per-View Matches 2018' is a mixed bag in terms of quality, but the majority of the great PPV bouts from 2018 have made it into the collection, ranging from world title bouts, to some of the big marquee gimmick matches, to the further emergence of the women’s division. The DVD set is a good snapshot of the highs and lows of WWE’s year, with plenty to learn from heading into 2019 and you can buy it from https://www.wwedvd.co.uk.